Required Filings Show How Much Lobbyists Spent To Benefit Individual Lawmakers, But The Filings Don’t Tell The Whole Story. LANSING (Feb. 28, 2019) — Four lawmakers who now hold influential positions in the Michigan House were among the most well fed by lobbyists in 2018. According to an analysis of new disclosures, registered lobbyists disclosed buying at least $1,000 in food and drink for 27 different state lawmakers in 2018. Among the four lawmakers who received the most free food and drink were the incoming speaker of the House and the incoming chair of the House Ways and Means Committee. Rep. Lee Chatfield, a Republican from Levering, became speaker — the top leadership position in the House — in January 2019. During 2018, lobbyists reported buying him $4,308 in food and beverage, which was the second highest total for the year. Chatfield chose Rep. Brandt Iden, a Republican from Oshtemo Township, to be the chair of a new committee called the House Ways and Means Committee, which will decide whether some bills advance to the full House. In 2018, lobbyists reported purchasing $3,795 in food and drink for Iden. Iden had the fourth highest total for the year. Two other key House Republicans were also among the top recipients of lobbyist spending last year. Rep. Jim Lilly, a Republican from Park Township, is now the vice chair of the Ways and Means Committee and also chaired the panel that recommended committee assignments for 2019-2020. He received $4,319 in lobbyist-purchased food and drink in 2018, according to disclosures filed by lobbyists. That total was the highest for an individual officeholder for the year. This year, Rep. Mike Webber, a Republican from Rochester Hills, became the chair of the House Regulatory Reform Committee, which handles proposals that impact a variety of industries. He received $3,049 in lobbyist-funded food and drink in 2018, the fifth highest total, according to the disclosures. The highest ranking Democrat was former Rep. Fred Durhal of Detroit. He received $4,140 in lobbyist-purchased food and drink in 2018. Durhal lost a campaign for the Michigan Senate in 2018. While the numbers don’t tell the full story of the benefits provided to some state lawmakers, they are among the few insights Michigan residents get into the relationships between officeholders and lobbyists who seek to influence policy decisions. The lobbying industry has been growing in Lansing in recent years. In 2018, a registered lobbyist in Michigan only had to report the name of an officeholder the lobbyist purchased food for if the lobbyist spent more than $60 on that officeholder in a month or $375 for the year. While some lobbyists voluntarily report smaller purchases, the thresholds could allow many purchases to go unreported. For instance, an 8-ounce filet at one of downtown Lansing’s most expensive restaurants costs only $36, well under the $60 monthly threshold. 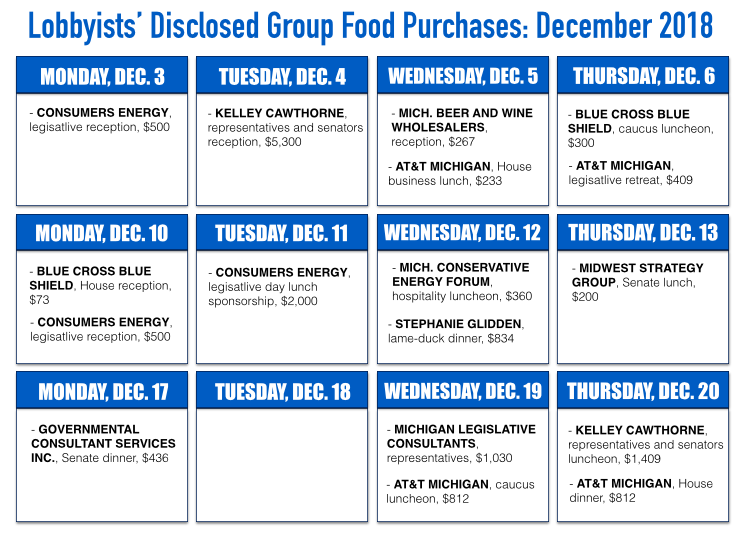 Also, lobbyists and interest groups can purchase meals for officeholders in large group. In 2018, lobbyists reported spending $247,863 on food and drink for officeholders in group settings. According to the filings, the most expensive event was a “legislative luncheon” sponsored by Molina Healthcare on May 16. Molina Healthcare reported spending $9,119. The event included “senators, representatives, department officials and staff,” according to a disclosure. The businesses that spent the most overall on group events in 2018 were the multi-client lobbying firm Kelley Cawthorne at $38,445, Consumers Energy at $25,414, the multi-client lobbying firm Governmental Consultant Services Inc. at $19,341 and the Michigan Cable Telecommunications Association at $16,998. As for purchases of food and drink in one-on-one settings, the disclosures don’t include information on which bills are discussed over the meals or often which clients are the focus of the conversations. The multi-client firm Governmental Consultant Services Inc. represents a wide variety of groups and businesses. It was the top purchaser of food and drink for 25 different officeholders during 2018, according to the disclosures. The 10 lawmakers who received the most in free and food drinks in 2018 are listed below. 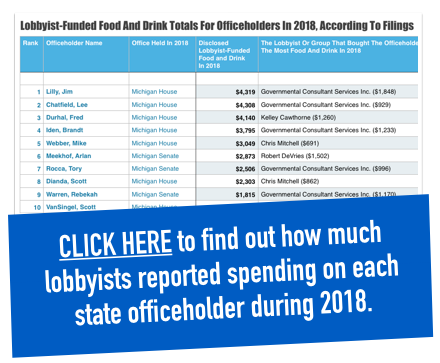 A full list of how much each officeholder received in lobbyist-purchased food and drink, according to lobbyist disclosures, is available at this link. Lawmakers who didn't benefit from any disclosed purchasers aren't included in the spreadsheet. Overall, lobbyists reported spending $625,803 on the broad category of food and beverage expenses in 2018. The majority of the spending can’t be traced to individual beneficiaries. The overall 2018 food and drink total was down from the 2017 total of $814,029. However, lobbyist spending on food and drink tends to increase in odd-numbered years when new lawmakers are first taking office. ARTICLE The Free Food Flows: Which Lawmakers Have Received The Most Free Meals In 2018?